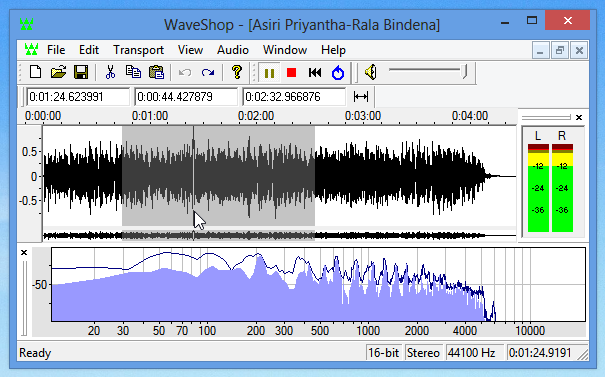 ‘WaveShop’ is a free & open-source audio editor for the Windows operating system. It’s also a ‘bit-perfect’ audio editor & thus, the audio that is loaded into ‘WaveShop’ will be the same that’s rendered to the sound output device, without adding any filters, unless chosen otherwise. You can ‘Copy/Cut/Paste/Delete’, ‘Undo/Redo’, ‘Select/Deselect’, ‘Zoom in/out’ etc with ‘WaveShop’. It also comes with a lot of audio filters/effects such as: ‘Amplify, Extract, Fade, Normalize, Re-sample, Channel insert, Swap Channels, Spectrum generation, Reverse audio’ & more. It supports loading and saving into a lot of different formats, but saving into ‘MP3’ is not yet supported. Also remember that, ‘WaveShop’ is only an audio editor, not a recorder (like ‘Audacity’). Update: Actually, recent versions of ‘WaveShop’ do support saving into MP3 format. For the instructions on how to activate it, please visit this page. Thanks ‘Petro’ (comments below) for the update :). ‘WaveShop’ 1.0.08 has also added supports for unlimited audio recording as well. 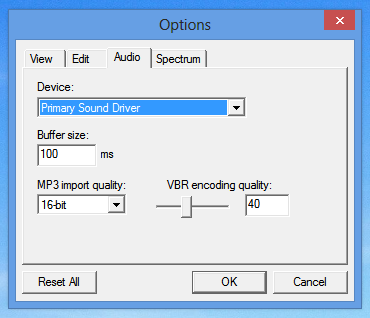 You can tweak some of its settings through the ‘Options’ window such as changing the audio buffer size, selecting the primary sound driver, setting an undo threshold (unlimited by default) and more. The latest version also comes with a brand new real-time spectrum analyzer. This is disabled by default, but you can easily enable it (& many other tools) by navigating to ‘View’ -> ‘More Bars’ -> ‘Spectrum Bar’ as well. Please remember that ‘WaveShop’ is a new utility & more features (including audio format support) will be added in the future releases. Although on its home page it says the supported OS’s are Windows 7, Vista & XP, I ran it without any issues in Windows 8 64-bit version. It has packages for both 64-bit and 32-bit versions of Windows, & a portable version is also available. If interested, then please download it from this page. Visit this page for getting more information. Thanks for the nice review! Just to clarify, as of version 1.0.06, WaveShop *does* support saving as MP3. WaveShop encodes MP3 via LAME, however the libmp3lame.dll is not included in the WaveShop download, so it’s necessary to obtain it, e.g. from RareWares. See the FAQ for complete directions. Thank you!, I updated the post :). Thank you, updated the post, again :). I have been using WaveShop for over 3 months and found it very easy and intuitive to work with after trying a half dozen others. I use it on 2 PCs recording stereo radio on an old Dell Dimention with XP and editing on a much newer 64 bit machine with Win7. For me about the only additional utility I could ask for is a recording timer.